Terminator is a useful terminal application that can fill a large area of screen space with multiple terminal instances in one window. The application is quite handy if you like to have lots of terminal open. With dedicated key bindings to switch quickly between multiple terminals, Terminator can greatly boost your productivity. Allow font dimming in inactive terminals. Allow URL handler plugins to override label text for URL context menus. When copying a URL, run it through the URL handler first so the resulting URL is copied, rather than the original text. Allow users to configure a custom URL handler, since the default GTK library option is failing a lot of users in non-GNOME environments. 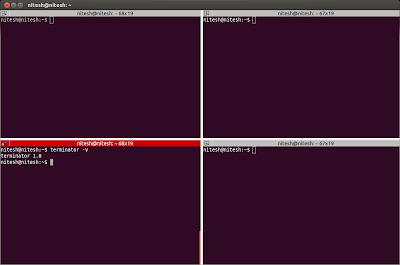 Allow rotation of a group of terminals. Add a keyboard shortcut to insert a terminal's number. Add a keyboard shortcut to edit the window title. Add an easy way to balance terminals by double clicking on their separator. Add a plugin to log the contents of terminals. Support configuration of TERM and COLORTERM. Support reading configuration from alternate files. 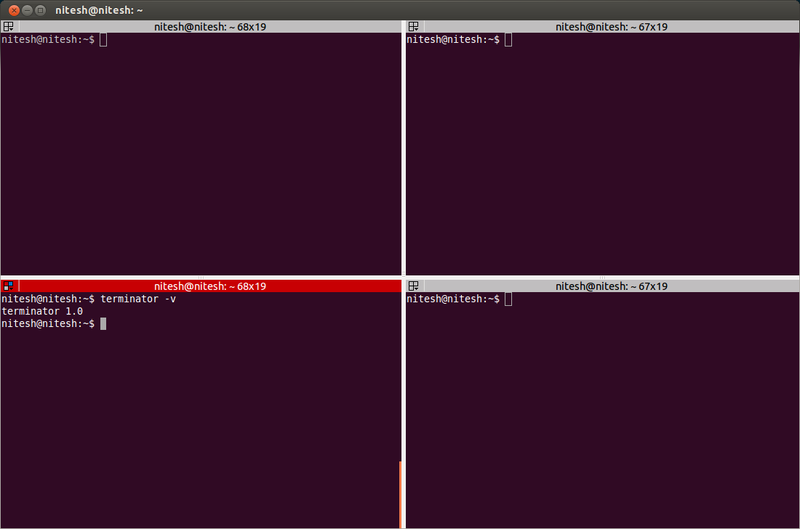 Guake is another useful terminal utility which works as a drop-down terminal. You need to press a key to invoke it and press again to hide, very similar to the console you might have seen in Quake game. Guake 0.4.4 was released few days back with many new features and fixes. I have now uploaded a new Guake package for quantal in Ubuntu Vibes PPA (a build for Ubuntu 12.04 is already available).